Math & Science Teachers Rejoice! Plan your next field trip to Xtreme Action Park and participate in the most exciting science-based experience in South Florida. Our go-karting and physics classroom sessions provide an unforgettable program featuring speed, inertia, friction, mathematics and hands-on experimentation with go karts and other science instruments. A Hands On Approach to Learning… Students will learn that a car is a laboratory of force, motion, and energy and that safe driving is a skill that requires a merging of science and sharp reflexes behind the wheel. 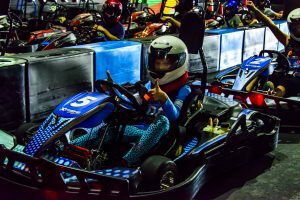 Through this program the students will get an opportunity to practice in real-life situations in go-karts – on the track!